MIAMI, Florida and NEW YORK, New York — September 24 2018 — Origis Energy and Global Atlantic Financial Group have entered into a series of agreements whereby Global Atlantic will take a minority equity position in Origis USA, LLC, the Miami, FL based holding company for Origis Energy, a top ranked U.S. utility scale solar developer. The transaction, which will strengthen the mutual activities of the companies in the renewable energy space, will also involve Global Atlantic’s acquisition of a series of projects developed by Origis. Prior to this agreement, Global Atlantic has invested in over 150 megawatts (MW) of utility scale solar projects developed by Origis Energy. 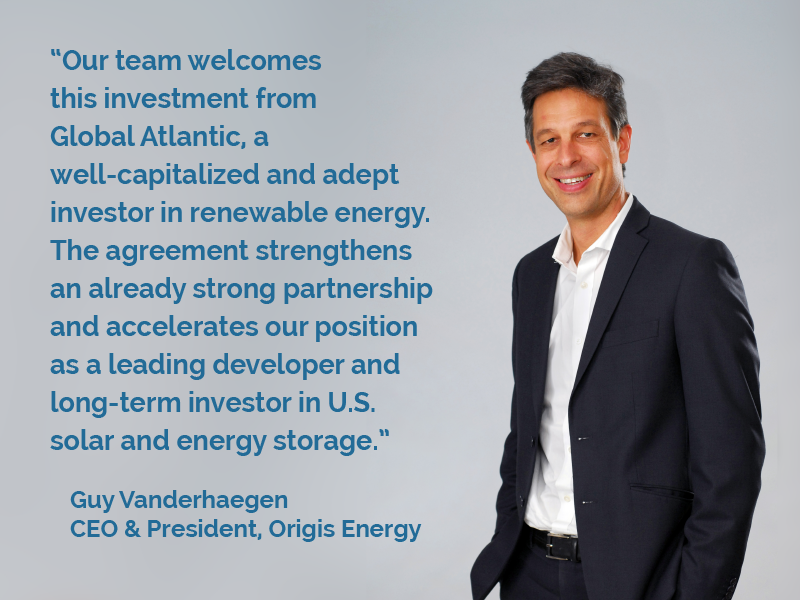 The agreement further strengthens Origis and Global Atlantic’s co-investment in development of new solar and energy storage investments and provides for partnership in acquisition and management of third party developed and operational assets. Citi served as sole financial advisor to Origis Energy. Global Atlantic was founded at Goldman Sachs in 2004 and separated as an independent company in 2013. Its success is driven by a unique heritage that combines deep product and distribution knowledge with insightful investment and risk management capabilities, alongside a strong financial foundation of over $70 billion in assets as of June 30, 2018.